<?xml:namespace prefix = o ns = "urn:schemas-microsoft-com:office:office" />A command sergeant major at Fort Bragg has died of injuries he suffered in a fatal crash Saturday on N.C. 87 near Sanford.Wayne A. Fausz, 40, a native of Florence, Ky., was the command sergeant major for the 1st Attack Reconnaissance Battalion, 82nd Combat Aviation Brigade, 82nd Airborne Division, according to a news release Thursday from Fort Bragg.He died Tuesday. Battalion Commander Lt. Col. John M. Cyrulik described Fausz as "an outstanding noncommissioned officer who always led by example and epitomized the Army values. "He was a warrior and consummate team player, well respected by the troopers, fellow NCOs and officers fortunate to serve with him during his exemplary service in the Wolfpack Battalion," Cyrulik said in the release. Fausz, who lived in Sanford, was driving a 2002 Ford F-250 pickup that was traveling north on N.C. 87. His wife, Natasha, 34, and children, 14-year-old Nathaniel and 9-year-old Autumn, were passengers, according to the Highway Patrol.The wreck happened about 9 p.m. when a southbound Chevrolet Blazer driven by Sebastian Talley, 18, of Cameron, crossed the center line and hit Fausz's truck head-on, investigating Trooper Shawn Riley said.Talley died in the wreck. Fausz and his children were airlifted to UNC Hospitals in Chapel Hill.A hospital spokesman said the children remain hospitalized, the spokesman said.Nathaniel is in critical condition while Autumn is in good condition, the spokesman said.Natasha Fausz was treated at Central Carolina Hospital and released, Riley said.Initially, there were reports that Talley may have fallen asleep while driving. Riley said Talley's father told him Sebastian had been working double shifts at Coty International in Sanford.A Coty spokeswoman denied that, saying Talley wasn't working that day and had not worked a double shift since he was assigned to the Sanford facility in June. Fausz joined the Army in July 1988 and served in Germany and at Fort Hood, Texas; Fort Campbell, Ky.; Fort Eustis, Va.; and the Pentagon, the Fort Bragg release said.He deployed twice to Iraq, in 2003 and 2004, and once to Saudi Arabia, in 1989-90, the release said.Fausz reported to the 82nd Airborne Division at Fort Bragg for a third tour in June 2008, when he assumed the responsibilities as command sergeant major for his battalion, the release said. Fausz was remembered as an inspiring leader. "I first met Command Sgt. 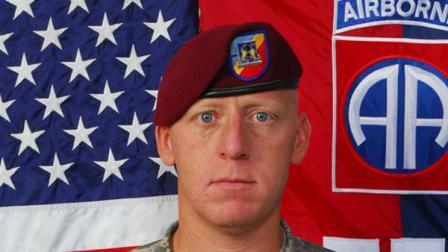 Maj. Fausz when I arrived at Forward Operating Base Tarin Kowt in July of 2009," said 1st Sgt. Daniel Moesch, who is assigned to D Troop, 1st Squadron, 17th Cavalry Regiment, 82nd CAB. "During our initial counseling, he immediately struck me as a leader who was very passionate about taking care of soldiers," Moesch said in the release. "During the deployment, Command Sgt. Maj. Fausz spent a lot of time talking about jumping, fishing, hunting and just about any other thing that came up," said Moesch, who served as the first sergeant for Troop A, Task Force Wolfpack, during the 82nd CAB's recent deployment to Afghanistan. "He was the kind of guy that you wanted to do a good job for, not because he told you to or that it was your duty, but because you didn't want to disappoint him," Moesch said. "I feel honored to have served with him and consider him a good friend and he will be truly missed. My prayers go out to his family in this time of mourning." Fausz was the recipient of the Legion of Merit, the Bronze Star Medal with two Oakleaf Clusters, the Meritorious Service Medal with one Oakleaf Cluster, the Army Achievement Medal with four Oakleaf Clusters, the Armed Forces Expeditionary Medal, the Afghan Campaign Medal with one Campaign Star, the Iraq Campaign Medal with one Campaign Star, the Global War on Terrorism Expeditionary Medal, the NATO Medal, the Combat Action Badge, the Master Aircraft Crewman Badge and the Master Parachutist Badge.In addition to his wife and children, Fausz is survived by his mother, Darlene Hinkle of Union, Ky.; his father, David Fausz Sr. of Independence, Ky.; and a brother, David Fausz Jr. of Queen Creek, Ariz.
KANDAHAR AIRFIELD, Afghanistan -- Two pilots serving with the 82nd Combat Aviation Brigade, 82nd Airborne Division, in Kandahar, Afghanistan, earned the Silver Star, the nation's third highest war-time medal for valor. Secretary of Defense Robert Gates presented the awards to Lt. Col Mike Morgan, the commander of 1st Squadron, 17th Cavalry Regiment (Task Force Saber), and Chief Warrant Officer James Woolley, a Chinook pilot assigned to 3rd Battalion, 82nd Aviation Regiment (TF Talon), in front of the Talon headquarters on Kandahar Airfield, Afghanistan March 9. Morgan earned the recognition for his part in repelling an insurgent ambush directed at a U.S. Army Engineer unit known as Task Force Target Hazards, Open Roadways, or THOR, while they were performing a route clearance patrol. The RCP was sweeping a route west of Kandahar City for improvised explosive devices when they hit an IED. After the blast, the RCP began receiving heavy enemy fire in what they soon realized was an orchestrated ambush. Morgan was air mission commander for a team of two OH-58 Kiowa Warrior helicopters that arrived in support of the RCP. According to his citation, Morgan repeatedly maneuvered his aircraft between rocket propelled grenade fire and heavy machine gun fire, enabling him to fire on and destroy the enemy positions. His "quick reaction, skillful employment of his and other attack weapons systems and coordination of multiple aircraft over a target" ultimately led to THOR's safe withdrawal from the enemy line of fire. 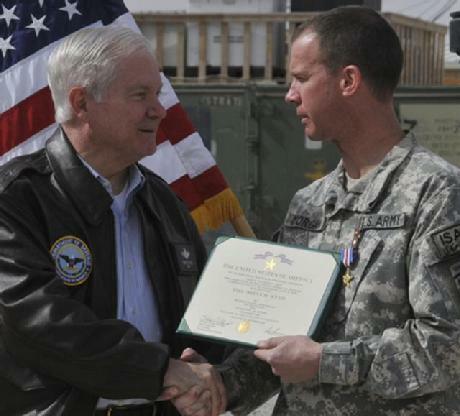 "I'm honored that the secretary of defense recognized the accomplishments of Task Force Saber, Task Force Talon, and Task Force Pegasus in southern Afghanistan," said Morgan. "Although there were singular, decisive acts that led to the receipt of this award, the incredible contributions and teamwork displayed by the 4th Engineer Battalion, aviation mechanics, armament technicians, forward arming and refuel personnel, and fellow aviators cannot be overlooked." Woolley, also an air mission commander during the operation where he earned the Silver Star, is a CH-47 Chinook helicopter pilot. In November 2009, Woolley and his crew were called for a casualty evacuation mission in Baghdis province, western Afghanistan. As Woolley and his crew approached the pick-up site, his left door gunner reported heavy tracer fire coming at them. Woolley and his co-pilot maneuvered to avoid the rounds. Once they were able to land, ground troops began loading five wounded Soldiers on the aircraft. Very quickly, the aircraft began taking more enemy fire. With less than a minute on ground, insurgents fired a rocket propelled grenade at Woolley's Chinook. The round penetrated the nose, flew between the two pilots, and hit the flight engineer in the back of the head before coming to a rest inside the helicopter, unexploded. Woolley and his crew continued to take a barrage of enemy fire, but Woolley directed the team to stay on ground until the last patient was loaded. Once the fifth patient was loaded, Woolley led the team out of the hot landing zone and back to a coalition base where the casualties could receive treatment. After they determined the aircraft was still flyable, Woolley made the decision to conduct a second casualty evacuation of several wounded and dead Afghan National Army soldiers. "I feel privileged," began Woolley. "I guess the best way to describe it is I feel the same as I did yesterday, but it is an honor to be recognized. I would've done it anyway, but it truly is an honor and a privilege to be wearing this on my chest." "These two officers displayed great courage while under intense enemy fire, while serving as air mission commanders in support of combat operations in Operation Enduring Freedom," said Col. Paul W. Bricker, commander of the 82nd Combat Aviation Brigade. "They exemplify the tremendous commitment to our mission and join the long line of 82nd Airborne Division paratroopers recognized for valor in defense of our nation."